Wow… That settles it– I\'m going to Antarctica! I actually said WOW out loud at first glace of this photo. So pristine! Gorgeous picture. Congrats on the noteworthy, an excellent image. This one is also hard for me to ignore. My goal for one of the coming years, I need to see this, feel this and breath this, thanks Harry. A member of the 2006,Irish Beyondendurance Expedition who crossed South Georgia via the Shackleton route. Great shot brought back some very cool memories. A breathtaking image – stunning, pure, clear simplicity. 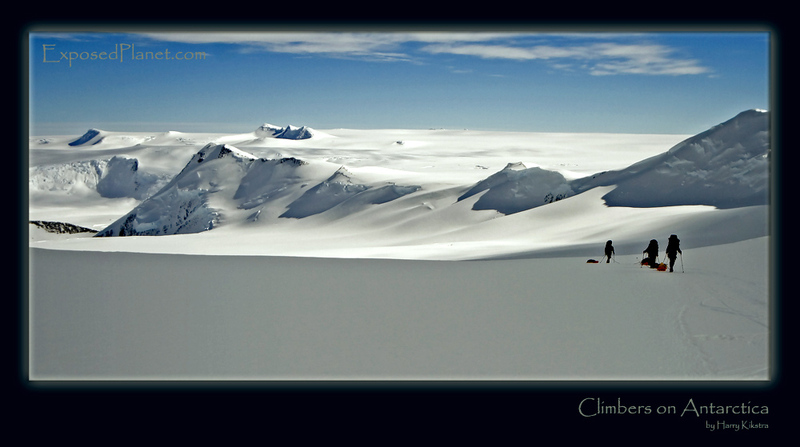 The story behind "Climbers with sleds on Antarctica"
Just after leaving BC the route up Vinson slowly ascends the glacier. No mules, no porters, but every member wil carry their own gear and the team supplies on a sled, making the ascent tougher than it might appear. The sun never sets, but once it is behind the mountains, the shadow reveals the actual temperature. Welcome to Antarctica, the largest freshwater reserve in the world, so fresh, it is not water anymore..
Voted Noteworthy on the December Photofriday Fresh competition. Thanks for voting!